This rotor/impeller fits the ARTEICH RO1100S. Impeller color and number of blades may also vary from the original rotor/impeller. Rotor/Impellers need replacing if you have a pump more than 3-4 years old and after cleaning and servicing the pump does not perform as well as when new. Or, the pump will not easily start back up after cleaning. 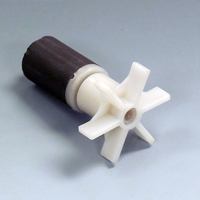 The magnets on a rotor/impeller gradually de-magnifies over time and pump performance will decline. This decline is hastened by poor maintenance, running dry or with little water and frequent power surges and outages.